Biotinylated Human Siglec-2, Fc Tag, Avi Tag (SI2-H82F8) is expressed from human 293 cells (HEK293). It contains AA Asp 20 - Arg 687 (Accession # P20273-1). The protein has a calculated MW of 103.9 kDa. The protein migrates as 115-120 kDa under reducing (R) condition (SDS-PAGE) due to glycosylation. 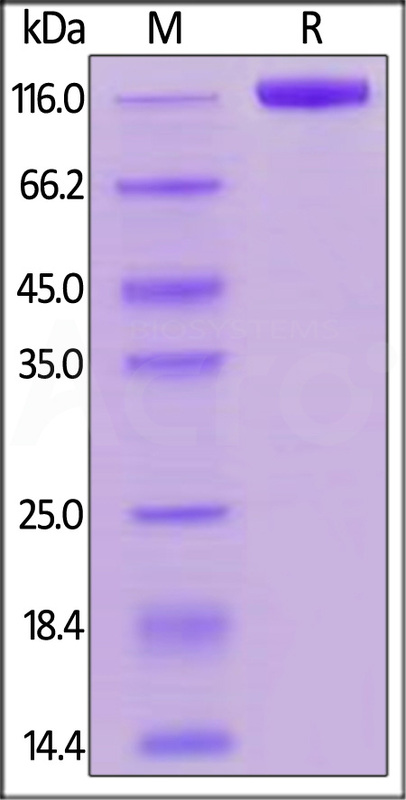 Biotinylated Human Siglec-2, Fc Tag, Avi Tag on SDS-PAGE under reducing (R) condition. The gel was stained overnight with Coomassie Blue. The purity of the protein is greater than 95%. 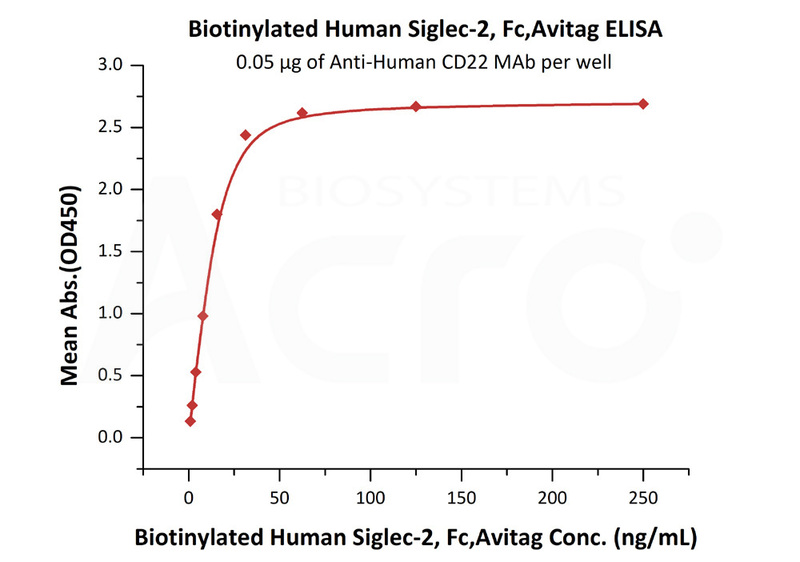 Immobilized Anti-Human CD22 MAb at 0.5 μg/mL (100 μL/well) can bind Biotinylated Human Siglec-2, Fc Tag, Avi Tag (Cat. No. SI2-H82F8) with a linear range of 1-16 ng/mL (QC tested). 293 cells were transfected with anti-CD22-scFv and RFP tag. 2e5 of the cells were first stained with B. Biotinylated Human Siglec-2 / CD22 Protein, Fc Tag, Avi Tag (Cat. No. SI2-H82F8, 10ug/ml) and C. Biotinylated Protein Control, followed by FITC Streptavidin. A. Non-transfected 293 cells and C. Biotinylated Protein Control were used as negative control. RFP was used to evaluate CAR (anti-CD22-scFv) expression and FITC was used to evaluate the binding activity of Biotinylated Human Siglec-2 / CD22 Protein, Fc Tag, Avi Tag (Cat. No. SI2-H82F8). B-cell receptor CD22 is also known as Sialic acid-binding Ig-like lectin 2 (Siglec-2), B-lymphocyte cell adhesion molecule (BL-CAM), T-cell surface antigen Leu-14, which belongs to the immunoglobulin superfamily and SIGLEC (sialic acid binding Ig-like lectin) family. CD22 mediates B-cell B-cell interactions, and may be involved in the localization of B-cells in lymphoid tissues. Siglec-2 / CD22 binds sialylated glycoproteins, one of which is CD45. Siglec2 / CD22 plays a role in positive regulation through interaction with Src family tyrosine kinases and may also act as an inhibitory receptor by recruiting cytoplasmic phosphatases via their SH2 domains that block signal transduction through dephosphorylation of signaling molecules. (1) Hatta Y., et al., 1999, Immunogenetics 49:280-286. (2) Doody G.M., et al., 1995, Science 269:242-244. (3) Tuscano J.M., et al., 1996, Eur. J. Immunol. 26:1246-1252.